Upper Fairfield Township needed to replace an existing, undersized pipe arch culvert under Kaiser Hollow Road and over Resser Run. The culvert replacement was part of a full depth roadway construction for 550 feet along Resser Run. William M. Scott, PE, CME with Bassett Engineering Inc. (BEI), the engineer on the project, stated that "the existing structure was undersized and in poor condition due to rusting and deformation. It was overtopped during the 2011 Tropical Storm Lee event which resulted in a road closure and significant detour." When the unstable embankment began to collapse, the road surface cracked and slumped towards the creek, risking a total collapse of the roadway. Overall, the result from localized flooding was water overtopping the road and severe stream bank erosion along Resser Run. 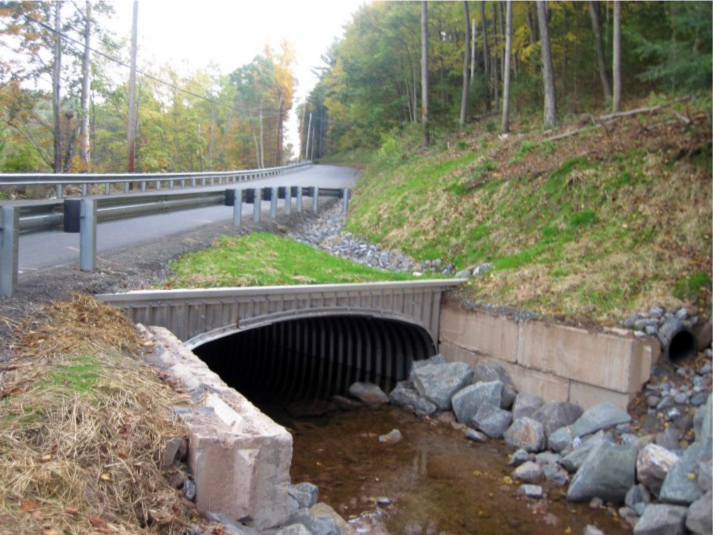 The project required the excavation, removal, and replacement of the existing culvert, stream channel improvements, stabilization of the stream banks with precast concrete blocks and riprap, site restoration, the placement of rock and fill, and roadway restoration. "The creek had been eating away at the culvert for a long time," township supervisor Luther Lunt said. "The banks were sliding down toward the water." Since Kaiser Hollow Road is one of the main roads in the township, the primary route for the local fire service, and carried truck traffic from a nearby natural gas well pad, time was of the essence. The road and culvert work was combined into one project with Act 13 natural gas impact fee funds utilized to finance the work done by BEI. A 16'-4" x 5'-11" Aluminum Box Culvert (ALBC) from Contech Engineered Solutions LLC, 50' in length, was selected as the best solution to replace the existing culvert. The ALBC was selected for its cost effectiveness as compared to a precast box culvert and for its rapid fabrication, assembly, and installation. The hydraulics for the 1555.2 acres (2.43 square miles) drainage area was analyzed using HY-8, a FHWA hydraulic design program. The wide span and low rise ALBC allowed the designer to increase the culvert end area from 23 square foot to 68 square foot and improve the hydraulic capacity of the original culvert from 163 CFS to 464 CFS. The road was closed for two weeks during removal of the existing culvert and installation of the new ALBC structure. The light weight ALBC was lifted into place using an excavator with no need for a crane. The installation went smoothly and quickly, providing Upper Fairfield Township with an affordable solution to a very difficult problem. "It's a good, solid job," Lunt concluded. "The ALBC has many benefits, including ease of installation, minimum road down time, environmentally friendly, and very cost effective. Cost is always very important to municipalities. We would not hesitate to use this solution again, and the new road and culvert should hold up well for a long time." In April 2016 at the 94th Annual Educational Conference of the Pennsylvania State Association of Township Supervisors (PSATS), this project received an honorable mention in the roadway category of the Road and Bridge Safety Improvement Awards. Each year, PSATS sponsors the statewide contest in partnership with the Pennsylvania Highway Information Association (PHIA) and the state Department of Transportation (PennDOT) to recognize townships for their extensive contributions of time and effort in making roads and bridges safer.